Cellulose acetylation has been reported as a side reaction of cellulose treatment with the ionic liquid 1-ethyl-3-methylimidazolium acetate ([EMIm][OAc]) (Karatzos et al. in Cellulose 19:307–312, 2012) and other 1,3-dialkylimidazolium acetate ionic liquids. 1-Acetylimidazole (AcIm), an [EMIm][OAc] impurity, has been found to be the actual acetylating agent (Zweckmair et al. in Cellulose 22:3583–3596, 2015), and the degree of acetylation was relatively low, below a DS of approx. 0.1%. Higher degrees of cellulose acetylation (DS > 10%) have been observed when the entire wood was mixed with [EMIm][OAc] instead of cellulosic pulp only (Abushammala et al. in Carbohydr Polym 134:609–616, 2015). In this paper, we explore the impact of wood constituents, mainly lignin, on cellulose acetylation using AcIm. The results demonstrate that lignin itself can be readily acetylated upon mixing with AcIm, and—noteworthy—that lignin presence significantly accelerates cellulose acetylation. 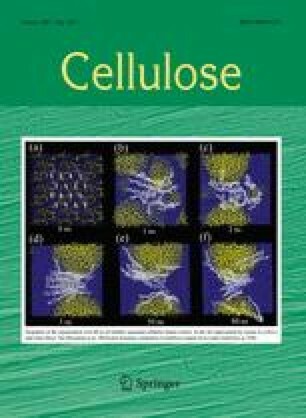 The initial rate of cellulose acetylation by AcIm increased from 1.8 to 4.7%/h when only 1% of lignin, based on cellulose mass, was added. A mechanistic study employing cellulose and lignin model compounds showed lignin to be more susceptible to acetylation than cellulose and to act as an intermediate acetyl group source for further cellulose acetylation in a catalytic scenario. The online version of this article (doi: 10.1007/s10570-017-1322-x) contains supplementary material, which is available to authorized users. The authors thank Sona Othman for the surface energy measurements and Marina Hagios for the GPC measurements.